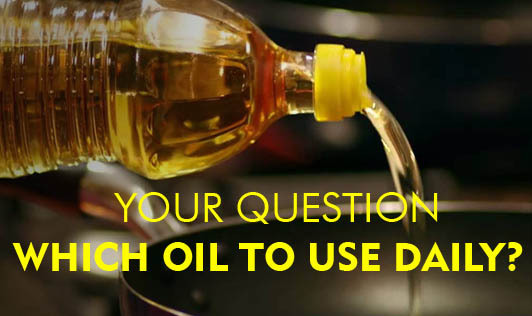 Your Question - Which Oil To Use Daily? Use any cooking oil - mustard or groundnut or soybean or gingelly (til) or rice bran or coconut oil or any other. Quantity is vital - use minimum quantities of oil everyday and do not exceed your limit. No oil is bad when taken in small quantities. None of the oils bring your cholesterol down. Preferably change your cooking oil every fortnight or every month so that you get the best of each variety. Olive oil is also good if you wish to spend a lot of money on cooking oil. If you don't want to buy an expensive oil, then any other variety of oil is fine. If you wish to avoid oil completely, that's fine too.......but make sure your meal is well balanced. This might be a topic for another article on another day! Do write if you have any questions or comments.